I saw Gloria Steinem twice in January 2014: first, in a small Indian airport, where we glanced at one another, then went back to our writing (Truth: she turned back to her iPad, I flipped open my laptop). Ignoring other westerners is a habit I’ve noticed in Asian and subcontinent airports, and besides I wasn’t entirely certain this was Gloria Steinem. I mean, wasn’t she about to turn 80? Afterwards, I waited in lines that snaked out of the tent towards the chai bar at the far end of the grounds, but had to leave before thanking her for what she has and still does for women and humanity — all of which she hears many times a day, I think and hope. 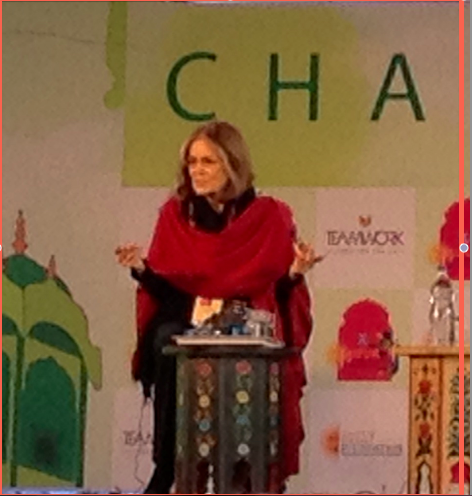 A day or two later in Jaipur I caught her in Vintage Gloria Steinem mode ( FB and friends who don’t care much for her or what she says, may want to skip this clip). I turn 70 on Sunday, 19 April, and unlike Gloria, who, I’ve read, expects her funeral to be a fundraiser, I prefer not to wait so long. Consequently, to celebrate my birthday, I’m holding a fundraiser for the school which is near to my heart, BLESS School, Tamil Nadu. I have borrowed shamelessly from her “This is what 40 [and last year, 80!] looks like.” Since I see nothing on her calendar for the w/e of 19 April, I am emboldened to ask if she would consider visiting Minneapolis, where we expect the snow to be cleared in time for the celebration. In fact, the weather will be fine – like Jaipur and Delhi in January! Thank you so much for writing and a very happy birthday to you! Unfortunately, Gloria is hard at work on her book manuscript and won’t be coming up for air before the 19th. She wishes you a big congratulations, as do we! !